The majority of the Raute population is settled in the Far West in Dadeldura District. 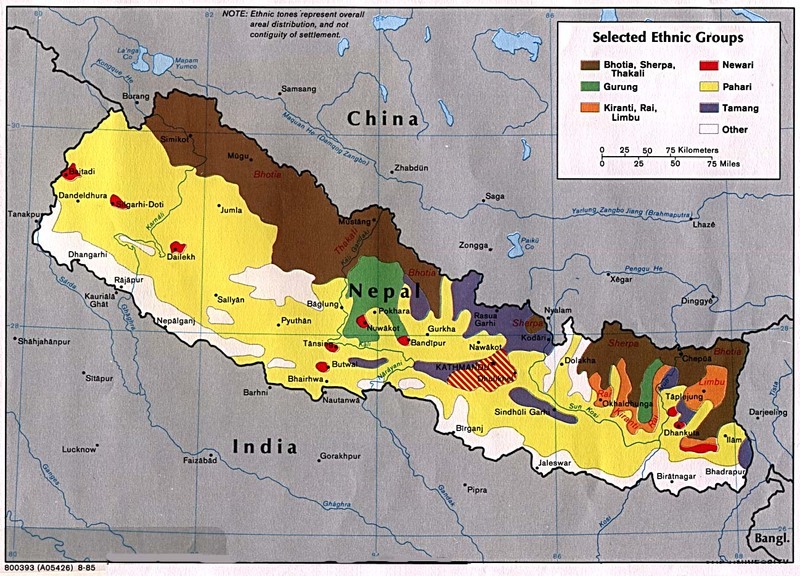 There are also populations of Raute in Surkhet and Dang Districts. The estimated population of the monolingual nomadic group varies by source. This nomadic group travels between many different districts in western Nepal. Linguistically, little is known about Raute. It is classified as Sino-Tibetan, Tibeto-Burman, Western Tibeto-Burman, Himalayan, Central Himalayan, Raute-Raji-Rawat (Ethnologue). It is thought that Raute is related to Rawat [jnl], Chepang [cdm], and Raji [rji], though further research is needed to clarify these relationships. Historically, the Raute have been nomadic hunter gatherers. However, in 1979 the nomadic Raute from Darchula District were forcibly resettled by the government to the middle hills of Dadeldhura. They were given land, but eventually most of them lost it to wealthier landowners. With the loss of their land, most of them moved back to the forest . With the change in location and living arrangement, many Raute bands took on new names and intermarried with surrounding groups. In Jarjarkot there are Raute who have intermarried with the surrounding Kami and Damai castes. A big obstacle to integration is the poor attitudes that many villagers have toward the Raute. The politics surrounding the Raute are vast and complicated. Currently, the government is giving each Raute family member 1,000 NRs per month in addition to the land and homes that have also been government-funded. There are no known Raute Christians. The religion they practice is a form of Animism. * Scripture Prayers for the Raute in Nepal.